Conventional drugs treat diabetes by improving insulin sensitivity, increasing insulin production and/or decreasing the amount of glucose in blood. Several herbal preparations are used to treat diabetes, but their reported hypoglycemic effects are complex or even paradoxical in some cases. This article reviews recent findings about some of the most popular hypoglycemic herbs, such as ginseng, bitter melon and Coptis chinensis. Several popular commercially available herbal preparations are also discussed, including ADHF (anti-diabetes herbal formulation), Jiangtangkeli, YGD (Yerbe Mate-Guarana-Damiana) and BN (Byakko-ka-ninjin-to). 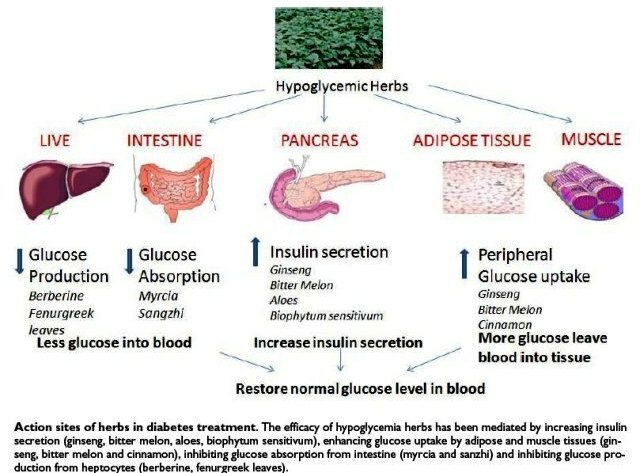 The efficacy of hypoglycemic herbs is achieved by increasing insulin secretion, enhancing glucose uptake by adipose and muscle tissues, inhibiting glucose absorption from intestine and inhibiting glucose production from heptocytes. gum infections and amputation . Insulin injections, glucose-lowering drugs and lifestyle changes, such as exercise, weight control and diet therapy, are recommended for treating diabetes. Hypoglycemic herbs are widely used as non-prescription treatment for diabetes . However, few herbal medicines have been well characterized and demonstrated the efficacy in systematic clinical trials as those of Western drugs. This review article highlights the current researches on the efficacy, side effects and action mechanisms of hypoglycemic herbs in vitro, in vivo and ex-vivo systems . Ginseng (Renshen): The therapeutic potency of ginseng mainly relies on its geographical locality, dosage, processing and types of diabetes. Panax ginseng (Chinese or Korean ginseng) has the highest therapeutic potency. Panax quinquefolius (American ginseng) is the medium potency grade ginseng, while Panax japonicus (Japanese ginseng) is considered the low potency grade ginseng. Thus, the most commonly used therapeutic ginseng is Panax ginseng. The anti-tumor, angiomodulating and steroid-like activities of ginseng have been recently delineated ¡K. This article is an Open Access article published in Chinese Medicine and originated from Bio Med Central. For full-text PDF article, please click <?xml:namespace prefix = v ns = "urn:schemas-microsoft-com:vml" /> to download.